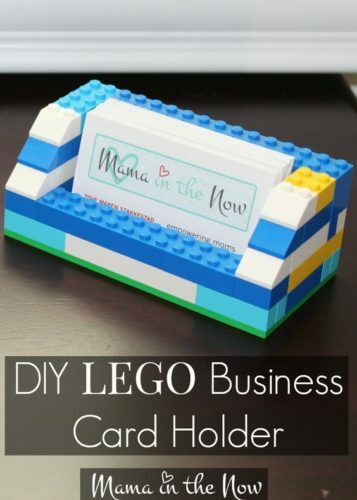 Whether you have business cards set out in your store, in a friend’s business, or at a craft fair, the most eye catching part can be the piece many people overlook—the business card holder, itself. My fiancé is a realtor, so he hands out business cards a lot. 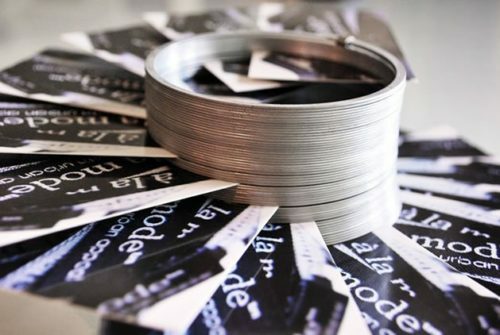 And placing business cards in friend’s or family’s businesses can be really helpful in getting his name out there. Before doing so, however, he wanted to come up with a way to make his cards stand out. Especially when he’s placing them in a business not directly related to real estate—like a hair salon. 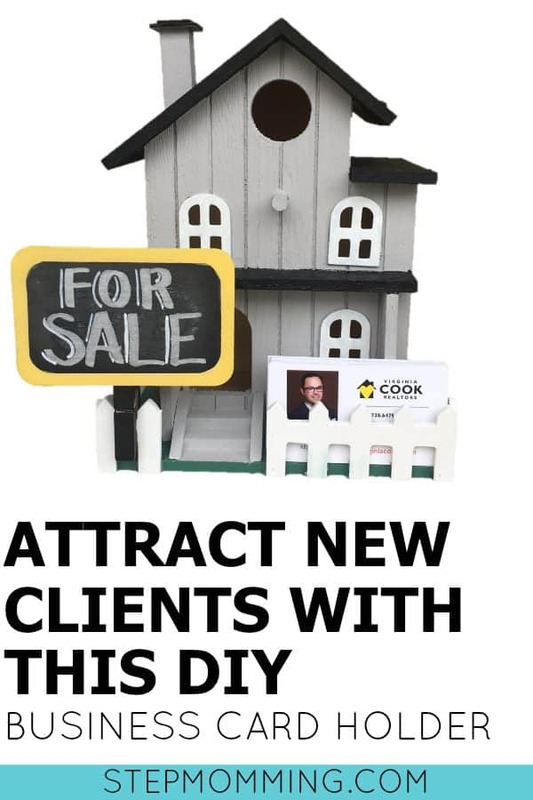 After much thought and throwing around a lot of ideas, we thought we’d try making a little “home for sale” sign business card holder. Buuuuut… then we went to Michaels. Now let me start by saying I love craft stores. Michaels, however, is my absolute favorite. Every time I walk into one, I’m overcome by inspiration. I start coming up with all these ideas of crafts I want to start, projects I want to do with the kids, art I want to make, etc. It can be pretty overwhelming. And also detrimental to my bank account. So, I take a secret weapon with me. My fiancé and I have to keep each other in check when it comes to sticking to a budget— so I like having him tag along. Otherwise I spend what feels like the whole day there buying much more craft supplies than I really need. Plus, he’s great at keeping the girls preoccupied while I look for the items I really need. 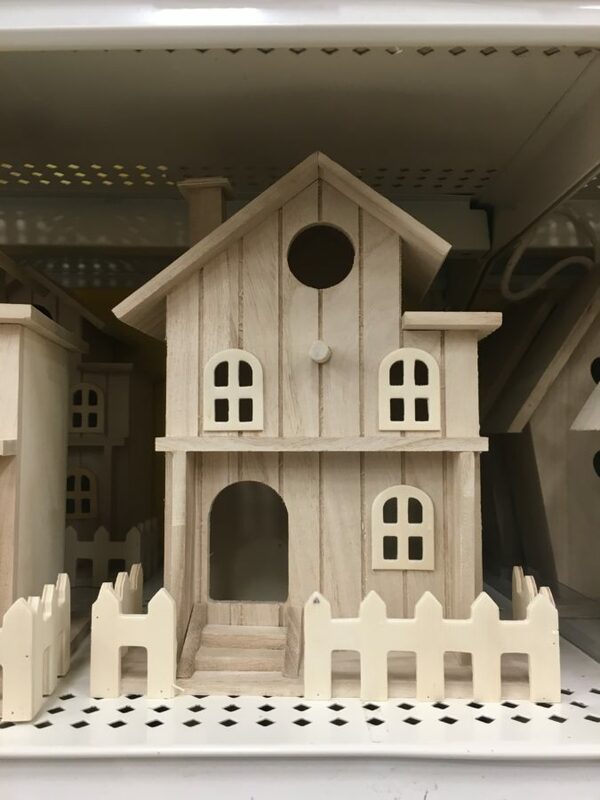 Anyhoo—we went to Michaels where James found this little wooden house with a picket fence around it. It was adorable! And it looked like it would hold a perfect amount of business cards. And I also got a tiny wooden chalkboard to make into a “for sale” sign. Using some enamel paint K got for Christmas last year, and just a bit of hot glue, the end result was pretty nice. What I loved most was how quick and easy it was to create. 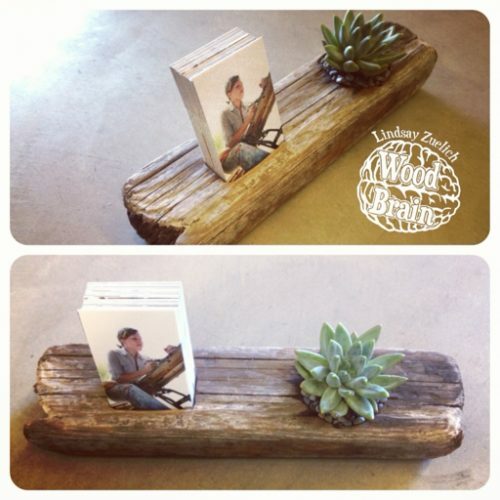 I love the idea of creating interesting card holders that fit your niche and display what your business is all about. I plan on making a few more for James with different model houses, as well as a few different artsy-styles for myself. You can go to Michael’s like I did, or just shop Amazon to have it all shipped to your door. When looking for the right kind of mini house, you’ll want to make sure it has a fence (or add your own) that you can slide the cards behind when you’re done. The house we found was just a bird house for $10. Super simple! We later found quite a few nicer houses on Amazon for a little more money. I’ll be getting one of those to make the next model! #1. Paint the house however you like. I painted Jame’s with my favorite house colors —black, white and grey. #2. 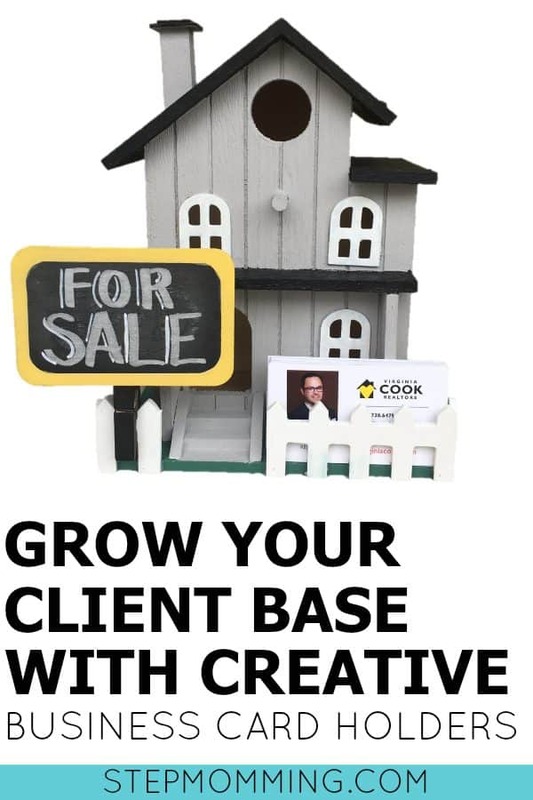 Now paint your mini chalkboard to be a “for sale” or “sold” sign. #3. 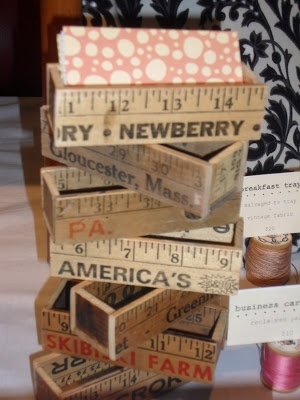 Paint your clothespin to match, then hot glue it to the back of the sign. 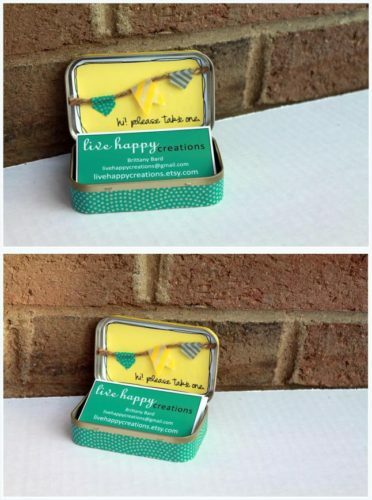 I actually purchased a mini chalkboard that already had a clothespin on it, but it was turned the wrong direction. I broke off the clothespin, painted it, and then hot glued it on the direction I wanted. #4. Clip the sign on your house’s fence. #5. Slide the cards into their slot! Obviously, you can get pretty intricate and detailed with your houses. I found fake grass, plants, picnic baskets, and all sorts of other miniature things at Michaels and on Amazon! Adding details may be the way to go, depending on the clientele you’re going for. Some of the model houses on Amazon get preeeeetty fancy. You can buy them already painted and just assemble them (and add a for sale sign). Or purchase it plain and paint it however you want, like I did. Just remember, you’ll want it small enough to fit on a counter top or wherever you’re displaying your cards. 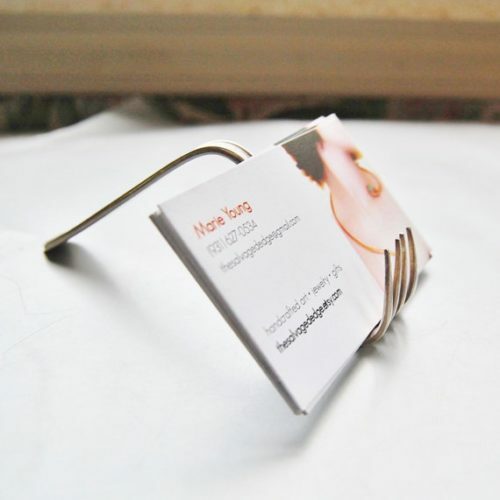 Looking for a card holder for a different kind of business? Whether you’re a freelance photographer or a craft fair surfing artist, there are lots of ideas out there for you! 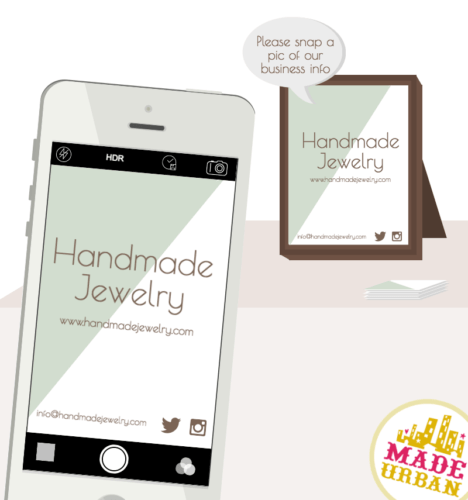 Fun Fact: Kristen actually made one of these to use for her business cards when she advertises her tutoring business! She shares some of her favorite tutoring games in Beyond the Classroom. Personally, I love the idea of having both at my disposal! Physical cards for those who want them, and the framed enlargement for those who don’t. No matter what your business is, making a good impression on customers and clients is just one element to solid branding. 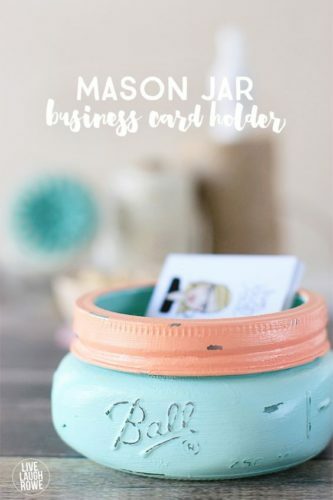 And making a business card holder that helps advertise that brand is one detail you can embellish to make people remember you! 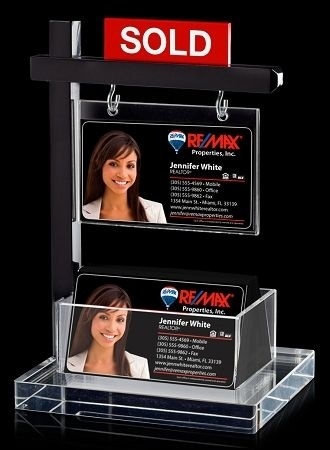 How do you display your business cards?